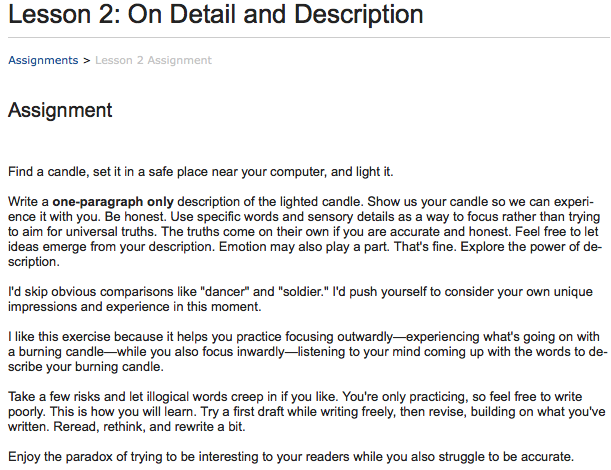 So, I’ve completed Lesson 3 of my “Beginning Writer’s Workshop” class (found on the ed2go website). The objective of that lesson was to “Get acquainted with the variety of forms available to the creative writer”. When I was thinking about signing up for the course, I was somewhat apprehensive. Although it was scary for me to think that “plenty” would not only be reading my assignments, but also making comments, I was hopeful that they, the “plenty”, would also be providing plenty of constructive feedback. My initial impression was that we would be a small group. I also thought that the group, along with the instructor and the instructor’s assistants would be reading and commenting on everyone’s assignments. So, this is the way it really is. The class has 300 participants. There is a short quiz and a writing assignment at the end of each lesson. 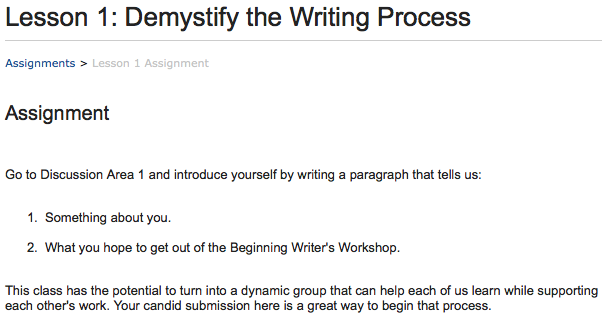 In order to have the assignment read, it has to be submitted to the discussion area. The discussion area is in a forum format. Unless otherwise noted, the instructor or one of her assistants will read and comment on each assignment submitted. The students can also read and comment on each assignment submitted. I did receive a comment on my first assignment. Although it was not quite specific, it was certainly encouraging. I was determined to be an active member of the class. I promised myself that I would read and comment on each and every one of those 300 assignments. After plugging through the first 50 or so, I knew that there was no way I would be able to read and comment on all of them. Heck, I could not even manage to read all of them. Since the default sort of the forum is by date created, I quickly realized that those who were among the first to submit their assignments were the ones whose pieces would most likely be read. By the time I submitted mine it fell somewhere in the middle of the list. What I found interesting about the 50 or so introductions that I did have the chance to read was that most of the writers wanted to achieve their life long dream of having a piece of work published. This is not something that I am aiming for. So far, I have to say, the lessons have been helpful and I am learning new information about writing and I’m gaining knowledge. The title of Lesson 2 is “On Detail and Description”. I learned several things. Be specific instead of vague. A major virtue of a well-written vivid description is that the reader will stop seeing words on a page and mentally experience the thing, person or place I am describing. When I am describing something I care about, ideas will naturally tend to emerge. By selecting details that show how a person is feeling is the most effective way to communicate emotion. Be as honest as you can when writing description. I found this to be an eye-opening lesson. I realized that when I write my blog, I depend heavily on photos instead of words. I found this to be a difficult, yet rewarding challenge. It was fascinating to intently concentrate on an object and realize that I was able to notice such fine detail that I would not ordinarily have seen nor appreciated. The vintage brass candleholder is the type that might have been carried by the Lady of the house to light the way up the darkened hallway, guiding her to her chamber. The curved handle is crafted into a floral shape with a loop to fit a thumb and forefinger. A white candle sits in the center of the flower. The square base was apparently designed with molded sides so that it would accommodate a box of matches or perhaps a few trinkets. 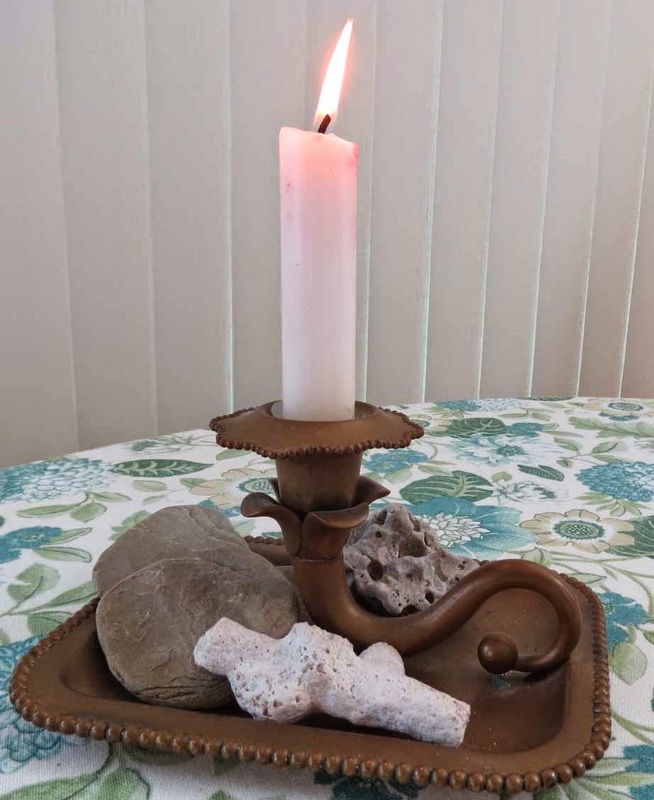 Presently it holds two pieces of gray, flat smooth lake rock along with a couple of chunks of weathered coral. The candle has been lit before and is now half of its original size. Although it is white, there are streaks of red running down the sides. I am curious about why that is and find myself distracted trying to figure out how that happened. The wax has pooled at the top but is not dripping down the sides yet. The triangular flame appears to be dimensional. When first lit, the flame quietly bounced up and down in a slightly rhythmic way and seemed to be floating above the blackened wick. I had an urge to run my finger through it. Now that it has been burning for a while, the wick has tilted and it’s end is hotly glowing red. The urge to run my finger through it has wisely disappeared. I received only one comment. It was from the instructor. This comment was specific and again encouraging. I would have liked more suggestions from her about how to improve it, though. I did read several of the other submissions. I found it interesting that we each described the details of the flame in similar words. Going into lesson 4 - “Try Out Different Points of View”, I have realistically concluded that I have to approach the rest of the course differently. Instead of expecting and looking forward to “plenty” of feedback, I have decided to concentrate more on what I am learning from each of the lessons. On a whim I signed up for and paid $99 for an online course. The name of the class is Beginning Writer’s Workshop in I found through the ed2go website. I’ve taken two writing classes in my life. One was “Creative Writing” and the other was “Writing for Business”. Both of those were oh so long ago. The class started yesterday with an optional pretest. Of course, I took the pre-test. I must admit most of the questions were common sense. There were a few more “technical” questions as they related to what I call the formalities of writing. There are many writing terms that I am not familiar with. But even with my lack of “formal writing” training, I scored okay on the pre-test. 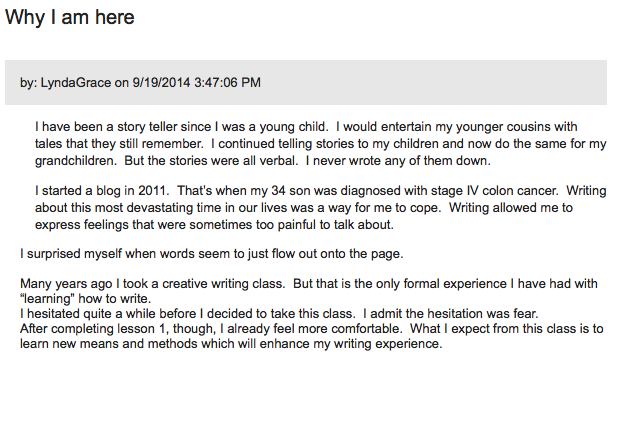 One of the reasons I impulsively decided to take the course was to learn how a writer writes. What does the process entail? Does a writer’s mind work differently than a non-writer? I have always been fascinated when I hear authors talk about the characters they have created. They speak about them in a Dr. Frankensteinien way. Do they have a more heightened imagination than non writers? When I write, I am basically putting my thoughts into written words. So, I have been hesitating to delve into Lesson No. 1. I am afraid. Perhaps I’m afraid that I will find out that I am a better knitter than I am a writer. My latest completed project. 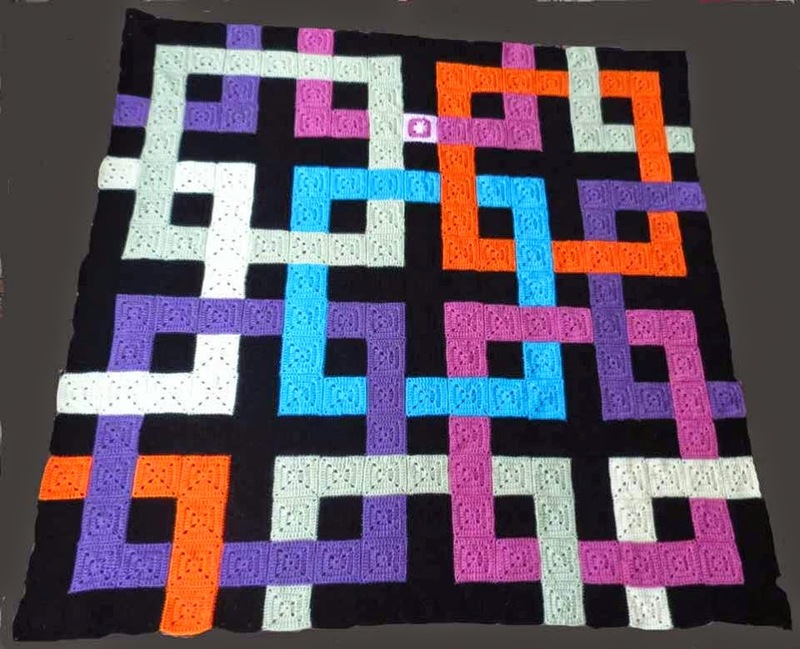 An afghan with 289 individual granny squares sewn together. 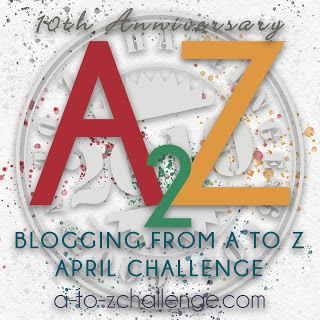 As an incentive to get through the six weeks and complete the course, I intend to record my progress on my blog. We are on a little get-a-way. Actually we were not really trying to get away. I would say it’s more of a desire for a change of scenery. So, yesterday, we left the Jersey shore area and headed up to the mountains. 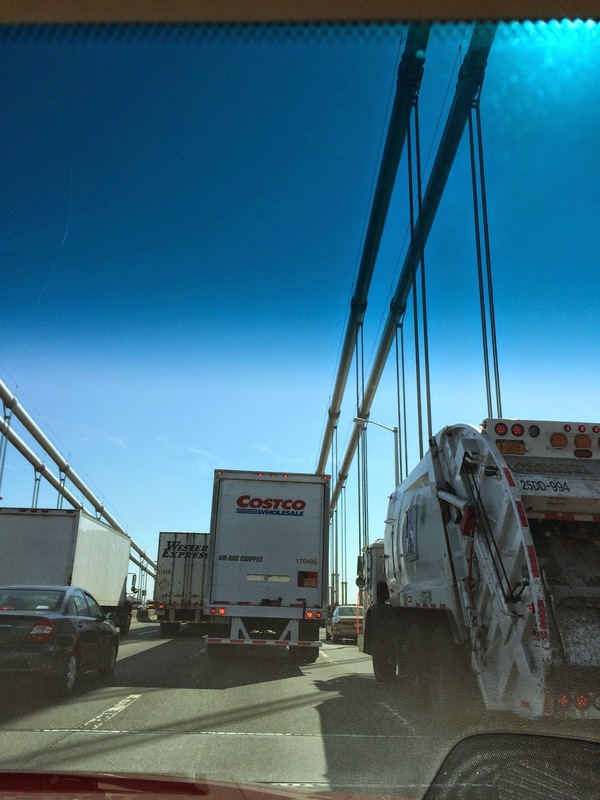 We had to cross over the GW bridge first to get out of NJ. After the bridge, there was no traffic and the rest of the 4-1/2 drive was pleasant. The change of scenery that we were looking for was immediate. We left behind yellow sand and blue sea to travel along green, hilly and curvy roads. The meadows are softly lavender, and wildly golden. Spotty emerging dabs of orange, and red are beginning to peek through. Red barns and white silos complete our picturesque drive. We debated over our lodging. I have a hard time picking. Well, that’s because when I go to check out each of the travel websites, the first thing I do is look at what kind of rating former travelers have given the places. Let me be more specific. The first thing I really do is read the “poor” ratings first. I mean I can generally tell when the negative comments are not pertinent. For instance, one woman complained that her son woke up the first morning with a few bites. Of course she claimed that they were from bed bugs. Interesting that not one of the other 500 comments mentioned anything about having a buggy stay. So, I ignore those kinds of comments. I do pay attention to complaints about cleanliness, outdated accommodations and rude staff. There are many quaint B&B’s here. There are also vintage throw back roadside motels. Actually some of the motels got excellent reviews. I decided, though, to go with the tried and true Marriott. I am pretty happy with a comfy bed, reliable WIFI and a flat screen TV. We will check out the other accommodations, though. I would rather judge those for myself in person. We were told that the falls were only 15-20 minutes from town. After driving for 45 minutes we decided that the legendary Bish Bash falls are just that. A local legend. Anyway, today is a rainy day. I’ve been up since six waiting patiently for Ross to wake up. Well, time for breakfast. It’s complimentary with Marriott, you know. We’ll see what the day will bring.